Hetty Pegler's Tump is a barn dance ceilidh band providing live music of a traditional nature, for dancing or listening. We are probably one of the longest running and most experienced Barn dance/Ceilidh bands in Gloucestershire. The band was formed in 1976 by Tony and Caroline Gibbons and over the years there have been many erstwhile members but Tony, Caroline and Hamish form the basis of the band with various fiddle players adding the extra sound when a larger band is required. We offer you very danceable & vibrant music which, in all modesty, we consider has "positive drive and a strong rhythmic pulse, an excellent sense of timing, and a feel for harmony and spontaneous improvisation." Our music is mainly English, Irish, Scottish, and American country dance tunes. European & Scandinavian tunes are included from time to time and when required we are able to provide specialised tunes from an extensive Playford and Early Music repertoire. We just wanted to say what a brilliant time everyone had at the barn dance. We have been asked for your name by several people, so hopefully we have given you some trade! You played an excellent set and I hope you enjoyed the evening too. We all loved it and greatly appreciated the band and caller going on even longer than planned. The choice of tunes & dances, the lively playing and stamina of the musicians and subtle management by the caller of an increasingly boisterous crowd were appreciated by all and made a wonderfully enjoyable & memorable evening. It was the first 'proper' ceilidh experience for most of the English, Irish, Welsh & Australians (!) there, and they made a point of thanking us for the ceilidh in particular, and swore they'd have to have a ceilidh for their major celebrations in future! Ceilidh veterans loved the musicality and variety of instrumental combos, and we oldies particularly valued the volume - which was perfect - loud enough to encourage everyone folk to take the floor, but not so loud that we couldn't converse easily. These pages are brought to you by the HPT: protocol, using 100% recycled electrons.
" What a funny name!" 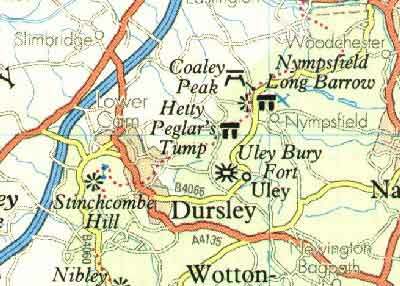 Our one is near Dursley, Glos (map); it's also known as Uley Long Barrow. Hetty Pegler is either - the local name for a witch, or, more likely, the person who once owned the land on which the tump stands. David Bedford wrote a piece of music called "Hetty Pegler's Tump"
Generally for barn dances. Some are public dances, many are private parties, quite a few are wedding receptions. 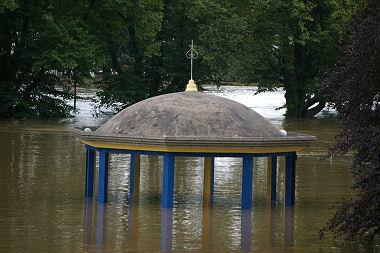 A typical venue will be a hall - village, church, hotel, school, sports&social club, or university campus. Sometimes it's a marquee in the back garden of a house or a pub. Castles - Berkley, Caerphilly, Clearwell, Sudeley. Tithe barns - Bishop's Cleeve, Bredon, Postlip, Stanway, Ashleworth. Converted barns - Tetbury Great Barn, Cripps, Kingscote. Evesham Abbey park Victorian bandstand. At all dances we work with established callers from across the area who lead the merry-makers through each dance. Sometimes we play just for listening in pubs, such as the Gardeners Arms (Alderton), during Cheltenham Gold Cup week. Six successive appearances at the annual Tibberton & Taynton flower show. Four consecutive years for the “Forum for the Future” annual meeting. Bristol docks for the naming ceremony of the pilot cutter “Morwenna”.